This chapter addresses best practices in providing trauma-informed care for patients from other countries and cultures including immigrants, refugees, and those seeking asylum. By appreciating the diversity of experience patients have, providers with cultural humility can better recognize trauma, work with the patient and community to address the patient’s trauma, and deliver high-quality, compassionate care. Different ways patients may come to the country and some of the traumatic experiences they may encounter are reviewed. Helpful models such as the Culturally and Linguistically Appropriate Services (CLAS) and the Substance Abuse and Mental Health Services Administration (SAMHSA) standards are described as well. 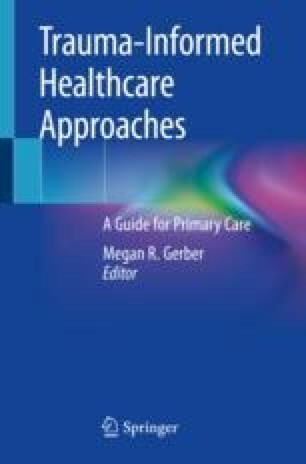 The chapter concludes with practical clinical concerns that frequently arise and tips for best practices. United Nations High Commissioner for Refugees (UNHCR). Protecting refugees: questions and answers. 2002, February 1. Available from: http://www.unhcr.org/afr/publications/brochures/3b779dfe2/protecting-refugees-questions-answers.html. Division of International Protection/United Nations High Commissioner for Refugees. UNHCR resettlement handbook. 2011. Available from: http://www.unhcr.org/46f7c0ee2.pdf. McAuliffe M, Ruhs M. Making sense of migration in an increasingly interconected world. 2017. In: World migration report 2018 [Internet]. Geneva, Switzerland: International Organization for Migration (IOM), Accessed 29 July 2018. Available from: https://publications.iom.int/system/files/pdf/wmr_2018_en_chapter1.pdf. United Nations High Commission for Refugees. UNHCR global trends report: forced displacement in 2016. Accessed 29 July 2018. Available from: http://www.unhcr.org/5943e8a34.pdf. Perruchoud R, Redpath-Cross J. Glossary on migration: International Organization for Migration; 2011, 2nd. Available from: https://publications.iom.int/system/files/pdf/iml25_1.pdf. United Nations High Commission for Refugees. UNHCR global trends report 2016. 2016. Available from: http://www.unhcr.org/5943e8a34.pdf. Office of Minority Health/US Department of Health and Human Services. Nationally Culturally and Linguistically Appropriate Services Standards (CLAS). 2013. Available from: https://www.thinkculturalhealth.hhs.gov/clas/standards. National Committee for Quality Assurance. A practical guide to implementing the national CLAS standards: for racial, ethnic and linguistic minorities, people with disabilities and sexual and gender minorities. December 2016. Accessed 2 March 2019. Available from: https://www.cms.gov/About-CMS/Agency-Information/OMH/Downloads/CLAS-Toolkit-12-7-16.pdf. Substance Abuse and Mental Health Services Administration. Improving Cultural Competence. Treatment Improvement Protocol (TIP) Series No. 59. HHS Publication No. (SMA) 14-4849. Rockville, MD: Substance Abuse and Mental Health Services Administration, 2014. Accessed 2 March 2019. Available from: https://samhsa.gov/system/files/sma14-4849.pdf. National Center for Cultural Competence/Georgetown University Center for Child and Human Development. Bridging the cultural divide in health care settings: the essential role of cultural broker programs. Washington, DC: Georgetown University Medical Center; 2004. Accessed 29 July 2018. Available from: https://nccc.georgetown.edu/documents/Cultural_Broker_Guide_English.pdf.